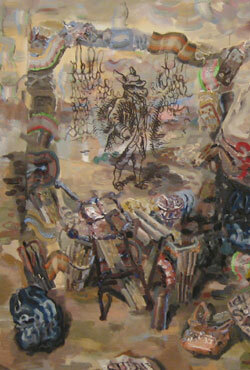 It took me some time to get into the paintings currently on display at Wynick/Tuck Gallery. From a distance these new works by Carol Wainio appear muddy, messy and grey, but as you approach them and spend time with them stories come out of the shadows. The larger paintings each show a structure of some kind, like the framing of a half-finished shack, set in a wasteland of multi-coloured smears and smudges of paint that extend all the way to the horizon. Line drawings of anthropomorphic characters can be seen through the frame acting out a scene or part of a story. In the foreground empty grocery bags litter the floor of the shack and bits of unused wood lean against the structure. It's a strange parallel to make but these images remind me of the make-shift homes I stumbled upon in Osaka when I was there a few years ago. People were camping in parks and under roads using tarps and scrap wood to build shelters. It made me nervous to wander through these homeless camps but at the same time I really wanted to explore. Like Pinocchio on Pleasure Island. Wainio's paintings drew me in in the same way. With titles like Story Bird and Abandoned Book #1 it becomes clear that the structures shown are meant to look like open books. The characters like illustrations for a story.The scraps of wood are in the shapes of letters. The bags suggest that fairy tales are no longer wanted. The wasteland is our defunct imagination. New Paintings by Carol Wainio is at Wynick/Tuck Gallery (401 Richmond st. w. Suite 128) until June 30th.